Some 25 years ago, give or take, I bought a poster of Louis Stettner’s Brooklyn Promenade. It is the only photo poster I ever bought and I still have it. It hangs in my wife’s and my bedroom. 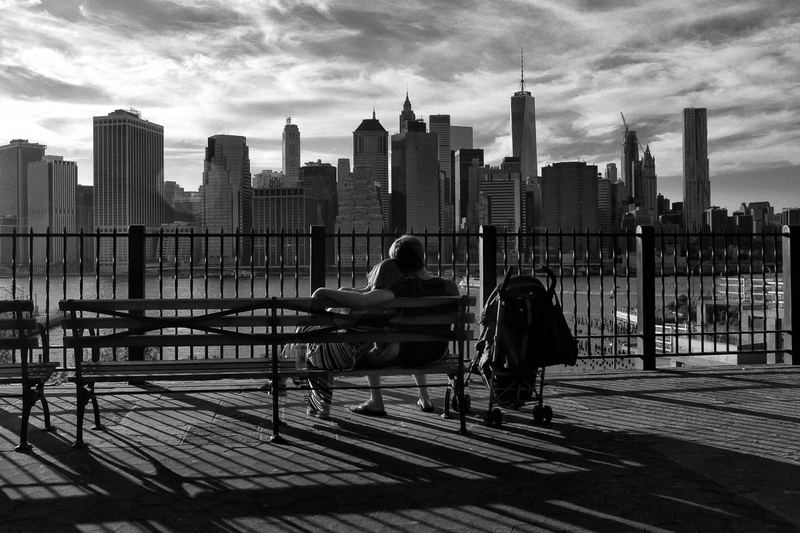 I love the old NYC skyline and the subject, who is perfectly absorbed in his own reverie. It looks like a model shot, but it is not. Last week, my friend Justin semi-privately shared his version of a scene made famous by Anselm Adams. Inspired by this, I decided to go get my own promenade shot. I went to the promenade late Sunday afternoon. I hoped to find a subject as seemingly content and lost in the moment as Stettner’s subject. I also planned to render in color, because the point was to create something inspired by Stettner’s shot, not to just recreate it as closely as possible. But when I started processing this image the late afternoon shadows pushed me towards a black and white version more like the original. The camera angle is different, both with respect to the foreground subjects and the Manhattan skyline. Also, chances are this is not the exact same bench. I believe, however, that I captured some part of the original mood.